Sell-out show a success as villa notch five wins. Carlisle Villa ABC picked up five wins from their home show last week – while a further two boxers made their debuts in skills bouts. Joe Kelly and Jordan Cummings claimed unanimous wins at the club’s first show of the season on Friday, while Brodie Stephenson stopped her opponent in the first round. Kayden Hull and Jammy Andrews then put the icing on the cake with split-decision victories in front of a sell-out crowd at the Crown & Mitre. Joe landed a fair share of early jabs in his bout against Max Rogerson of Hawick ABC, before switching to body shots as the Scotsman was forced onto the back foot. Also hitting Rogerson with right hooks around his high guard, Joe was caught by the odd jab but often countered them with a variety shots, including a solid straight right to the head. Joe was jabbing accurately early in the second round too, and it was through a jab, and a right hook, that he managed to enforce an 8-second count upon his counterpart. The crowd saw those seconds as an ideal time to spur on the Villa schoolboy, and he duly reacted by catching Rogerson right after the restart with another solid jab. Still peppering the Scottish boxer with shots, Joe was firing in punches towards both head and body as Rogerson struggled not only to defend, but also to attack. Rogerson’s defence was slack – as typified when Joe landed another good jab in the first seconds of the final round – and he was continually stormed by a variety of shots. Joe, on the other hand, was defending strongly, and he continued to impress as a precise jab followed by a shattering right hook found Rogerson’s head in the closing stages. Dominant from the first bell till the last, Joe sailed to a unanimous victory and ensured that Villa’s first win of the night was an emphatic one. Jordan, meanwhile, was looking to his maintain his unbeaten competitive record, and the 23-year-old’s third bout came against Christian Jopling of North Road Gym ABC. Both boxers looked to fine-tune their punching early on as some shots fell just short, but Jordan soon hammered his opponent with a crunching left hook to the head. The crowd reacted with commiserating ‘oohs’, but Jopling took it well and, when Jordan popped up from a body shot, the North Road boxer caught him with a strong jab to the head. Jordan pressed Jopling to the rope on a few occasions, but the man from County Durham – four years Jordan’s junior – defended well to pick off most oncoming punches. Shots were still falling short and being slipped, and there was some holding when it became a close-quarters contest, but Jordan managed to land a left hook before the first round ended. Jordan continued to box with intelligence in the second round – picking his shots, holding his opponent, and slowing down the tempo – and the Villa man soon landed a right cross through Jopling’s guard. Some clever movement from both competitors made it difficult for them to hit one another, with Jopling defending steadily but was not attacking with enough accuracy. The snappy punching continued in the third round and Jordan, who was still often pressing his opponent to the ropes, landed a clean early jab. Jopling was switching up his shots a bit more this round, working both body and head, but Jordan dealt with them admirably to claim another unanimous win for the Currock club. Making her first competitive appearance since her debut victory at Villa’s show last year, Brodie faced Shire Boxing Club schoolgirl Brooke Anderson, who had also won her only bout. Both boxers came flying out of the traps, each landing a couple of shots amid a flurry of punching, before Brodie shook Anderson with a devastating right-left to the head. Visibly unsettled, Anderson held her guard high and hoped for the best, but Brodie was firing in shots non-stop, hitting her opponent with one-two after one-two. Anderson’s guard was soaking up shots and was soon worn down by Brodie’s never-ending assault, with the Villa schoolgirl landing a few solid punches to the head before the referee initiated an early 8-second count. It proved to be Anderson’s only respite, however, as a clean left-right immediately after the restart saw the relentless Brodie press her opponent to the ropes before landing another few shots to the head. Brodie’s unrelenting combination of speed, accuracy and power was impossible to deal with, and Anderson was being hit by some big shots to the head as the ref swiftly stopped the bout and awarded the Villa youngster a TKO triumph. 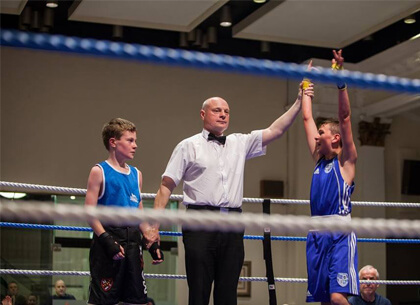 Kayden, having won his first three bouts, was another boxer looking to preserve an impressive record, and he was pitted against Jamie McMenamin of Greenock Boxing Club. Plenty of shots from both boxers saw them land a couple of jabs apiece early on, while McMenamin looked to gain some momentum with a good right cross to the head. After a scrappy sequence of boxing, Kayden pressed the Greenock man to the ropes and delivered a snappy jab, but his vulnerability to counterpunching saw him on one occasion hit back by a McMenamin jab. McMenamin tightened up his defences and landed a right cross in the second round, but not before Kayden caught him with another couple decent of jabs. Kayden, who took control midway into the round as he fired in a variation of body shots, then punched his opponent to the ropes and hit him with a left hook to the head. Still planting jabs on McMenamin in the third round, Kayden consistently kept his guard high to fend off the now more freely-throwing Greenock boxer. Having cornered McMenamin midway into the round, Kayden hit him with a good one-two and again parried away any oncoming shots, ultimately ensuring that he picked up a fourth successive win. The final bout of the evening – later decided to be the most entertaining – saw Jammy Andrews confront JR Gym boxer Kyle Fuller. Jammy was selecting his shots early on – throwing sharply before swiftly stepping away from counterpunching – and he soon landed a right cross to the head. Fuller had seemingly adjusted to Jammy’s style, but the Villa man then pressed his opponent to the ropes and delivered a series of good punches: an uppercut to the body, then a firm right cross and a left hook to the head. Jammy, firing in further shots to the body, did well to defend some strong Fuller punching, and when he was caught by a good right cross the 17-year-old soon hit back with a snappy jab. Still catching his counterpart with jabs, Jammy edged ahead when he landed a right cross, but Fuller responded with a left hook to the head and resolutely saw off the counterpunching. After the boxers had exchanged straight rights, Fuller slipped a Jammy shot and delivered a jab to his head, before landing another in the early stages of the final round. Fuller was edging the final round as a left hook found Jammy’s head, but the Villa man was defending best via his attack and landed some good shots after forcing his opponent to the ropes. Another right cross in the closing stages, coupled with more clean jabbing, helped Jammy to a split-decision victory as the evening ended on a high. In the other bouts, Aaron Wilkinson and Dean English suffered split-decision defeats, Lewis Hand’s good form was halted by a second-round stoppage, Luke Blakey was beaten in his second bout, and Daniel Yeomans lost on his competitive debut. In the skills bouts, meanwhile, Villa youngsters Archie Rattray and Dylan Farish made promising debuts against Currock House’s Isaac Carrigan and Anthony Forsyth respectively, while Romano Renucci boxed Ryan Thompson of Houghton and District ABC. Wigton ABC duo Robbie Pattinson and Ben Hale also featured, with the former winning unanimously and the latter losing via a split decision.